Ford hasn’t been as involved as Chevrolet or Dodge in the world of professional drag racing over the past decade, but for 2019, the Motor Company is back in the NHRA “big league” with a new Mustang funny car. Ford Performance shared the first picture of the new Mustang race car yesterday, with this car being piloted by Bob Tasca III as he takes on drivers in the Chevrolet Camaro, Dodge Charger and Toyota Camry funny cars. The NHRA Dodge Charger funny car program has had factory support for years now, with FCA’s Mopar division aiding in the design of the sleek, lightweight bodies used by Don Schumacher Racing. General Motors got involved in a similar program within the past few years, helping to design the Chevrolet Camaro funny car body for John Force Racing. 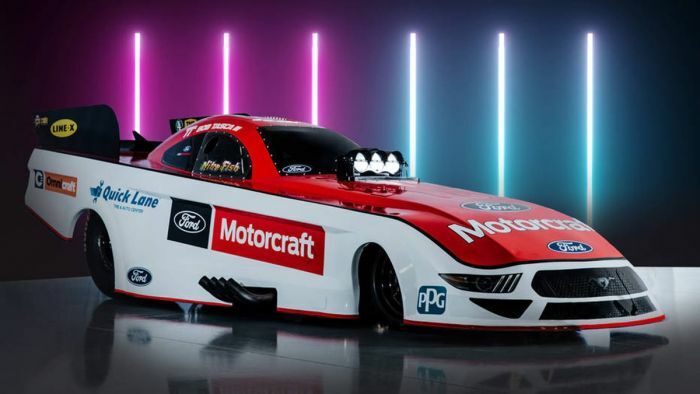 Meanwhile, FoMoCo has focused their motorsports efforts elsewhere, but when the upcoming 2019 NHRA season begins, two drivers will be running a Ford Mustang funny car body that was developed by Ford Performance engineers. Like all of the other cars in the series, the engines and drivetrains are provided by the individual teams, but for 2019, there will be two teams running Ford Mustang bodies designed by the Motor Company. The car shown here will be campaigned by Bob Tasca III while Tim Wilkerson – the stronger of the two drivers last season – will also utilize the new Mustang body. Both of these drivers have been running Mustangs in funny car for years, the Wilkerson being the leading Ford driver over the past few years. While the new Ford Mustang funny car is obviously shaped nothing like the road car, there are aspects of the shape that were borrowed from America’s most popular performance car. The design lines running from the front end, up around the supercharger intake to the windshield is similar to the shape of the road car’s hood. There is also a hard body line that runs along the sides of the car, creating a similar form to the body line of the Mustang road car. Finally, the front end of this funny car has an assortment of decals that replicate the look of the Mustang road car, complete with a faux grille and headlights. The new Ford Mustang funny cars will make their competition debut at the Winternationals in Pomona, California on February 7th through the 10th.